New York, NY – #OurPowerPRnyc today commemorated the one-year mark of Hurricane Maria slamming into Puerto Rico by bringing together in Union Square a large, diverse gathering of grassroots leaders, artists, activists and others from across the Puerto Rican diaspora to stand in solidarity with the many Puerto Ricans still struggling for survival and fighting to remain, reclaim and rebuild. #OurPowerPRnyc is a grassroots initiative uniting the Puerto Rican diaspora around a shared platform to address the injustice in the US government response to the humanitarian crisis, demand self-determination and sovereignty, and ensure a just recovery to and transition to regenerative economy. Speakers and performers urged participants to reflect on the devastating events of the past year, but also to uplift the many acts of resistance and resilience carried out on the island. Participants included: Congressional candidate Alexandria Ocasio-Cortez; New York State Senator Gustavo Rivera; New York City Council Member Carlina Rivera; Elizabeth Yeampierre, Executive Director of UPROSE; writer and activist Naomi Klein; Judy Sheridan-Gonzalez, RN, President of the New York State Nurses Association; poet, performer and activist Caridad de la Luz (aka “La Bruja”); musical performers/activists BombaYo, Yerba Buena, Tato Torres Saez; Rosa Clemente, PR on the Map; Roberto Mukaro Borrero, United Confederation of Taino People; #PoetsforPuertoRico; and Reverend Sam Cruz, Trinity Lutheran Church. 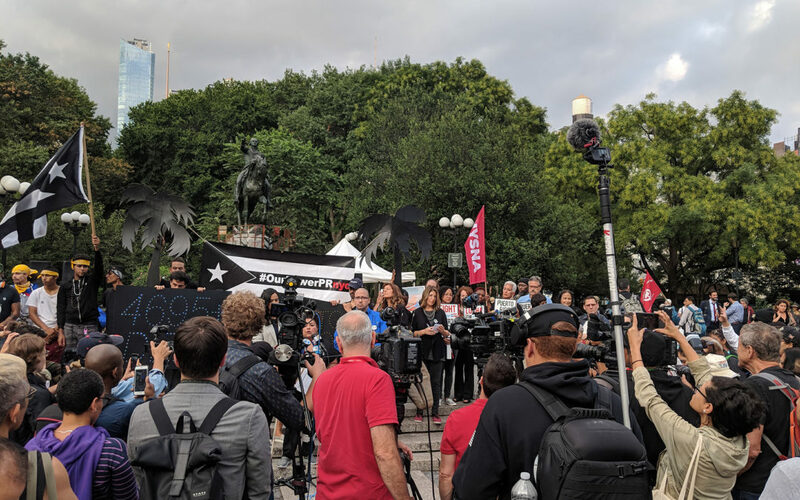 Jovanna Garcia Soto, Grassroots International, said, “This hurricane further exposed the crime of U.S. colonialism and its imposition of a violent neoliberal agenda in Puerto Rico, and that is hard to take in. But there’s another side to the story, resistance! Movements and frontline communities are centering their work on self-determination, decolonization of minds, bodies and territories, and multiple sovereignties — energy, territorial and food sovereignty. We have seen the radical self-managed movements across the island working at the grassroots, based on the capacity and potential of communities to identify their own needs, organize their own reconstruction and build long-term collective resilience/resistance. And we have seen the protagonist political role that grassroots feminism has to push this transformational vision. This brings me hope! “I’m going to the #OurPRPowerNYC Hurricane Maria Memorial Rally because on the one-year anniversary of the storm, now more than ever we need to be connecting with our elders and activists in the movement for environmental justice, and justice for Puerto Rico. And the only way we do that is by gathering in person to bear witness to the work that is being done, and listen and engage in discussion about the path forward,” said Alexandria Ocasio-Cortez, Congressional candidate (NY-14). “Disasters aren’t natural. They’re social, political. It’s our job to prevent them,” said Tania Rosario-Méndez, Executive Director of Taller Salud. #OurPowerPRnyc is a community-led initiative of the Puerto Rican diaspora guided by the Jemez Principles of Democratic Organizing. To find out more or join the campaign, please visit www.uprose.org or email info@uprose.org.